This report is a study of the relationship between legal firearm ownership and crime. It has been reviewed by academics with expertise in this area, in reaction to the process by the European Commission to amend the EU Firearms Directive with much more restrictions on legal firearm ownership. Between 2000 and 2012 almost 3 million people lost their lives by external causes in Europe (see chapter 2). Less than 2,4% were firearms-related suicides (see chapter 5). Less than 0,5% (12.076) were firearms-related homicides (see chapter 7). Both rates decreased by more than 30% in the last decade. There is no evidence of 1000 annual homicides committed with legally held firearms. The action of the European Commission seems unreasonable, since…. 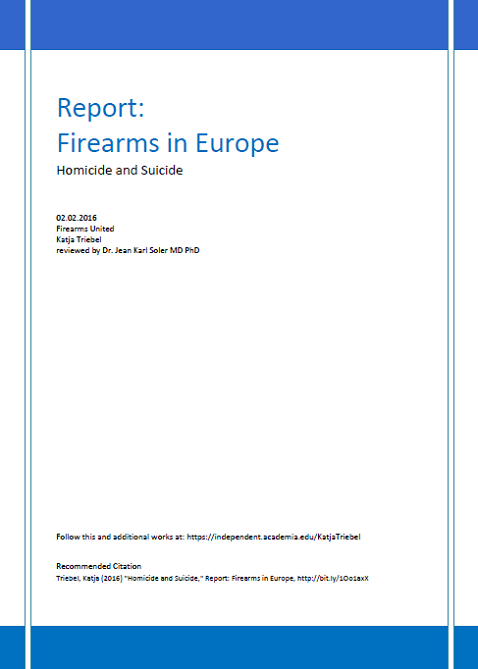 if the “Evaluation of the Firearms Directive” to promote the proposed changes, misuses individual “episodes” of crime or terrorism to generalise a mistrust of more than 16 million law-abiding citizens, especially when it is admitted therein that there are important gaps in the statistics (see chapter 8.1).